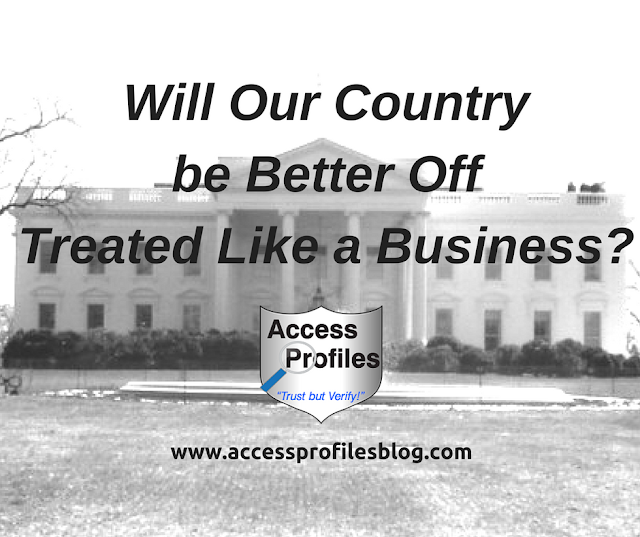 Access Profiles, Inc.: Will Our Country be Better Off Treated Like a Business? Will Our Country be Better Off Treated Like a Business? Our most recent elections are behind us and I have to admit I am very relieved to no longer see the political “ads” cluttering my television. However, in a very real sense, our political tasks are just beginning. No matter if President Elect Trump was your choice for President or not, I hope I join with many of you and challenge him and our Congress to view this as a time to pull together, both amongst themselves and among our citizens, and start anew. Old antagonisms need to take a back seat and a new spirit of cooperation should begin. The question now becomes, how can we move forward and achieve the balance and progress this country sorely needs? And an even bigger question....knowing Mr Trump's background, will our country now be run more like a business? With no prior political experience, it is not far fetched to think so. Running a business is what Trump knows. He is comfortable and familiar with the role. However, in most respects, Mr. Trump is also used to running the show with little outside interference. He focused on promoting and fulfilling his own agenda, getting what he wanted done, and taking his companies in the direction he chose. It was a one-man show. But do we want our country run the same way? Should We Run our Country Like a Business? 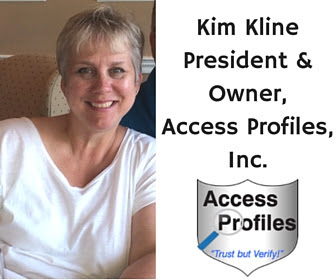 "Tweet This"
I believe it can work, if Mr. Trump is able to make some adjustments ~ and that means instead of thinking of himself as the head of a large, impersonal corporation, he embodies the mindset of a Small Business Owner! Imagine Trump as the owner of a Small Business. He has a closely held, vested interest in its success and growth. He is willing to “go the extra mile” to ensure it is run efficiently, cost-effectively, and ethically. Now go on to imagine our Congress as the board and employees of this small business. They are also invested in its success. They are willing and eager to put in the work to make that success happen and they desire the ongoing strength of this company at all costs. create a more productive government? I think this can be done by applying the strategies used by successful small businesses to the running of our government. Small Businesses, and their owners, are acutely aware of the world around them. They recognize the problems and concerns of their customers ~ and do everything they can to alleviate them. A Small Business is focused on cultivating respect, loyalty, and a positive image. A Strong “Mission Statement” or business plan – the company’s goals need to be well thought out and clear. No business, especially a small business, can thrive without one. An Understanding of Their “Customer” – that would mean Us! A business needs to recognize their customer’s needs and interests. And they also must work hard to earn their trust and loyalty. A Desire to Provide A Quality Product or Service – truly wanting to provide the very best to your customer. A Recognition of the “Bottom Line” – realizing the costs involved in running the business and understanding the need to keep the budget in check. As with any strong business, it needs to start at the top. President Trump needs to embody the characteristics of a great leader. It is up to him to create an atmosphere conducive to achieving goals and cooperation. The Ability to Create an Atmosphere of Mutual Respect – a place where all opinions are considered equally. It is also a place where people's rights are honored and protected (and this is crucial). This must be the foundation upon which everything else is built. Any lack of commitment here and nothing worthwhile can be accomplished. The Ability to Clearly Communicate the “Mission Statement” – the goals of the “company” (our nation) must be recognized and agreed upon. The Ability to Delegate – a leader must be able to pinpoint the “best person for the job” and empower them to get things done. The leader must also be willing to listen to these experts and ensure that any decisions further the ultimate goal ~ in this case creating a stronger and more respectful nation. The Ability to Inspire – a leader must be the driving force within a successful company. Mr. Trump must embody the strength of character and ideals that lead to success. In some cases, this may go against his "knee jerk" reactions. But to really succeed, it is crucial to gaining the respect he needs within his team, with our citizens, and with the world. The Ability to “Own” Mistakes and Learn from Them – a leader needs to be able to acknowledge errors and be able to guide his team beyond them. There is no doubt mistakes will be made. It is how Mr. Trump and those around him react to them that will define him and his presidency. Our Representatives and Senators then need to play their part. As the “board” of this company, it is imperative that they focus on the ultimate goal of a stable and strong nation. Agree to and Practice the Concept of “Mutual Respect” ~ there is no room for prejudices or agendas. Respect means caring about the quality of life of all our citizens. Understand and Believe in the “Mission Statement” ~ all actions need to be taken to achieve the agreed upon goals. Be Willing to “Step up to the Plate” and Use their Strengths Wherever Needed ~ bring your talents to the table. Cross party lines if necessary. Be willing to do whatever it takes to get this country on a good track. 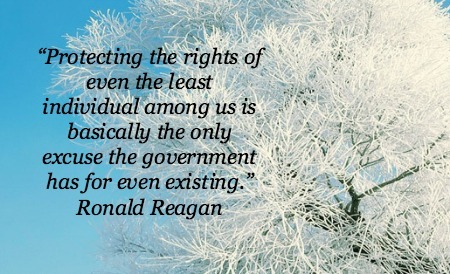 Desire the “Good of the Whole” over the Individual ~ everyone must truly want our country and all its citizens to succeed. And their is no way to accomplish this without working as a cohesive unit. the "good of the whole"
and move beyond individual agendas and prejudices. I am hoping that a little “distance” from this Election can find our leaders and representatives in a more cooperative mood. It is time to for them to put divisiveness in the past and begin working towards a common goal – creating an America full of hope, prosperity, and good will for all its people, not just a select few. We, as citizens, also need to do our part. Our elected officials are there to “represent” us, so we need to embody a spirit that is worthy. We must put our own prejudices and divisiveness aside. Remember, we are all vested in the stability of our country and this should unite us as one. We are also charged with making sure our government knows what is important to us ~ and that includes electing representatives that will help. But we also must be willing to work for it. That includes volunteering and community service for causes we believe in. Getting involved in our neighborhoods, and beyond, is what makes a difference. We must also be ready to make our government aware when they have failed us! That means peaceful protests and voicing our opinions through direct communication with our elected officials and with our votes. Let’s make sure our government is doing everything they can to ensure our country is strong, unified, and prosperous – and embracing a “small business mentality" might just be the way to accomplish that! shall not perish from the earth”. I can help you achieve your own goals! Are You Ready to Say Goodbye to 2016?